In November 1917, upon the disintegration of the Russian Empire, a diet of the Autonomous Governorate of Estonia, the Estonian Provincial Assembly, which had been elected in the spring of that year, proclaimed itself the highest authority in Estonia. Soon thereafter, the Bolsheviks dissolved the Estonian Provincial Assembly and temporarily forced the pro-independence Estonians underground in the capital Tallinn. A few months later, using the interval between the Red Army's retreat and the arrival of the Imperial German Army, the Salvation Committee of the Estonian National Council Maapäev issued the Estonian Declaration of Independence in Tallinn on 24 February 1918 and formed the Estonian Provisional Government. This first period of independence was extremely short-lived, as the German troops entered Tallinn the following day. The German authorities recognized neither the provisional government, nor its claim for Estonia's independence, counting them as a self-styled group usurping sovereign rights of the Baltic nobility. In late November 1918, Soviet forces moved against Estonia. On 28 November 1918, the 6th Red Rifle Division struck the border town of Narva, which marked the beginning of the Estonian War of Independence. The 6th Red Rifle Division attacked with 7,000 infantry, 22 field guns, 111 machine guns, an armored train, two armored vehicles, two airplanes, and the Bogatyr class cruiser Oleg supported by two destroyers. The town was defended by men of the Estonian Defence League (Home Guard) (consisting partly of secondary school students) and Infanterie-Regiment Nr. 405 of the German Army. The Reds captured Narva on 29 November, and the Infanterie-Regiment Nr. 405 withdrew westwards. The Soviet 2nd Novgorod Division opened a second front south of Lake Peipus, with 7,000 infantry, 12 field guns, 50 machine guns, two armored trains, and three armored vehicles. Estonian military forces at the time consisted of 2,000 men with light weapons and about 14,500 poorly armed men in the Estonian Defence League. The end of November 1918 saw the formation of the Baltic Battalion, primarily a mounted machine-gun company plus infantry. Estonia's Baltic German minority provided a sizable troop of volunteer militia for the Battalion, which was one of the first fighting units of the Estonian Army, and maintained staunch loyalty to the authority of the Republic. This contrasts with the Baltische Landeswehr in Latvia. The 49th Red Latvian Rifle Regiment took the Valga railway junction on 18 December and the city of Tartu on Christmas Eve. Also on Christmas Eve, the 6th Red Rifle Division captured the Tapa railway junction, advancing to within 34 kilometers of the nation's capital Tallinn. Estonian Bolsheviks declared the Estonian Workers' Commune in Narva. Colonel Johan Laidoner was appointed Commander in chief of the Estonian armed forces. He recruited 600 officers and 11,000 volunteers by 23 December 1918. He reorganized the forces by setting up the 2nd Division in Southern Estonia under the command of Colonel Viktor Puskar, along with commando units, such as the Tartumaa Partisan Battalion and the Kalevi Malev Battalion. A British Royal Navy squadron commanded by Rear Admiral Sir Edwyn Alexander-Sinclair arrived at Tallinn on 31 December, and delivered 6,500 rifles, 200 machine guns, and two field guns. The squadron captured two Russian destroyers, Spartak and Avtroil, and turned them over to Estonia, which renamed them Vambola and Lennuk. 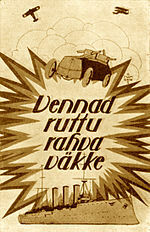 On 2 January, Finnish volunteer units with 2,000 men arrived in Estonia. Three armored trains were built in Tallinn under the command of Captain Anton Irv. In the second half of February, the Red armies started the new Soviet offensive to capture Estonia. To this end the Soviets established what was referred to as the new 'Estonian' Red Army. This sizable force consisted upwards of 80,000 conscripts. On 27 March, the Estonian 3rd Division was deployed along the western flank of the southern front under the command of Major-General Ernst Põdder. At Võru, the situation became critical on 22 April when the Red Army approached to within 1.5 km of the town. Heavy fighting continued at the southeastern front up to the first half of May. Although the Estonian Army had attained control over its country, the opposing Red armies were still active. The Estonian High Command decided to push their defense lines across the border into Russia in support of the White Russian Northern Corps. On 13 May, the Northern Corps went on the offensive at Narva, catching the Soviets by surprise and destroying their 6th Division. The offensive was supported along the Gulf of Finland's coast by the British and Estonian navy and marines. With the front approaching, the garrison of the Krasnaya Gorka fort mutinied. But the 7th Red Army received reinforcements and counterattacked, pushing the White Russians back, until the front was stabilised with the support from the Estonian 1st Division on the Luga and Saba rivers. The offensive of the Estonian Petseri Battle Group began on 24 May. The 600 troops of 1st Estonian Rifle Regiment of the Red Army together with Leonhard Ritt, commander of the 1st Estonian Rifle Division switched side on the same day. Offensive destroyed the Estonian Red Army, captured Pskov on 25 May and cleared the territory between Estonia and the Velikaya River of Soviet forces. A few days later White Russian forces arrived in Pskov, but as they were unable to defend the town on their own, some Estonian forces remained in Pskov, while the rest were pulled back to the state border. The Northern Corps mobilised members of the local population in the Pskov region. On 19 June 1919, the Estonian Commander-in-Chief General Johan Laidoner rescinded his command over the White Russians, and they were renamed the Northwestern Army. Shortly afterwards, General Nikolai N. Yudenich took command of the troops. Simultaneously with the Pskov offensive Estonian 2nd and 3rd divisions also started southward offensive into Northern-Latvia. By end of May they had captured Alūksne and Valmiera. Due simultaneous German-Latvian offensive in Western-Latvia situation was becoming very difficult for the Soviets. On 31 May, an Estonian cavalry regiment led by Gustav Jonson reached Gulbene, capturing large amount of rolling stock, including 2 armoured trains. Rapid offensive of 2nd Division, spearheaded by its cavalry regiment, continued and on 6 June it crossed Daugava river and captured Jēkabpils. But 3rd Division could not support advance of 2nd division anymore as it was now facing a new enemy: the Baltische Landeswehr. The war against the Baltische Landeswehr broke out on the southern front in Latvia on 5 June 1919. The Latvian democrats led by Kārlis Ulmanis had declared independence as in Estonia, but were soon pushed back to Liepāja by Soviet forces, where the German VI Reserve Corps finally stopped their advance. This German force, led by general Rüdiger von der Goltz, consisted of the Baltische Landeswehr formed from Baltic Germans, the Guards Reserve Division of former Imperial German Army soldiers who had stayed in Latvia, and the Freikorps Iron Division of volunteers motivated by prospects of acquiring properties in the Baltics. This was possible because the terms of their armistice with the Western Allies obliged the Germans to maintain their armies in the East to counter the Bolshevist threat. The VI Reserve Corps also included the 1st Independent Latvian Battalion led by Oskars Kalpaks, which consisted of ethnic Latvians loyal to the Provisional Government of Latvia. On 3 June, Estonian General Laidoner issued an ultimatum demanding that German forces must pull back southwards, leaving the broad gauge railway between Ieriķi and Gulbene under Estonian control. When Estonian armoured trains moved out on 5 June to check compliance with this demand, the Baltische Landeswehr attacked them, unsuccessfully. The following day, the Baltische Landeswehr captured Cēsis. On 8 June, an Estonian counterattack was repelled. The first clashes demonstrated that the VI Reserve Corps was stronger and better equipped than the Soviets. On 10 June, with Entente mediation, a ceasefire was made. Despite the Entente demand for the German force to pull behind the line demanded by the Estonians, von der Goltz refused and demanded Estonian withdrawal from Latvia, threatening to continue fighting. On 19 June, fighting resumed with an assault of the Iron Division on positions of the Estonian 3rd Division near Limbaži and Straupe, starting the Battle of Cēsis. At that time, the 3rd Estonian Division, including the 2nd Latvian Cēsis regiment under Colonel Krišjānis Berķis, had 5990 infantry and 125 cavalry. Intensive German attacks on Estonian positions continued up to 22 June, without achieving a breakthrough. On 23 June, the Estonian 3rd Division counterattacked, recapturing Cēsis. The anniversary of the Battle of Cēsis (Võnnu lahing in Estonian) is celebrated in Estonia as the Victory Day. The Estonian 3rd Division continued their advance towards Riga. On 3 July, when the Estonian forces were at the outskirts of Riga, a ceasefire was made on the demand of the Entente and the Ulmanis government was restored in Riga. The German forces were ordered to leave Latvia, the Baltische Landeswehr was put under the command of the Latvian Provisional Government and sent to fight against the Red Army. However, to circumvent Entente's orders, the troops of the disbanded VI Reserve Corps, instead of leaving, were incorporated into the West Russian Volunteer Army, officially hired by the German puppet Government of Latvia and led by Pavel Bermondt-Avalov. In October, fighting restarted when the West Russian Volunteer Army attacked Riga. Following the Latvian request to help, Estonia sent two armoured trains to aid repelling the German attack. The Estonian army also remained to support the defence of Latvia against Soviets by defending the front north of Lake Lubāns. The Estonian Army High Command in 1920. From upper left: General Major Ernst Põdder, Dr. Arthur Lossmann, General Major Aleksander Tõnisson, Colonel Karl Parts, Colonel Viktor Puskar, Colonel Jaan Rink. From bottom left: General Major Andres Larka, General Major Jaan Soots, Commander in chief General Lieutenant Johan Laidoner, Admiral Johan Pitka and Colonel Rudolf Reiman. The 7th and 15th Soviet Armies advancing behind collapsing White Russian forces continued to attack the fortified positions at the state border near Narva. The first clashes took place on Luga River on 16 November, starting the conclusive battles with 120,000 Soviets facing 40,000 Estonians. After repeated attacks, the 7th Red Army managed to achieve some limited success. At the end of November the situation on the front calmed, as the Soviets needed to replenish their forces. In order to pressure Estonia in the peace talks, intensive Soviet attacks restarted on 7 December. On 16 December, the situation became critical as forward units of the 15th Red Army crossed the Narva River. The next day, an Estonian counterattack pushed the Soviets back. The Estonian high command actively reinforced the 1st Division at Narva during the battles, sending in the headquarters of the 3rd Division. General Tõnisson became commander of the Viru Front. After suffering 35,000 casualties in heavy battles, the Red Army was completely exhausted by the end of December. Concerned with having Bolshevik rule in the South, Finland delivered funds and weapons. Finland provided 5000 rifles and 20 field guns by 12 December. Finland also sent 3500 volunteers. Pohjan Pojat led by Hans Kalm fought at the Southern Front, including at the Battle of Paju, while I Suomalainen Vapaajoukko led by Martin Ekström fought at the Viru Front, including at the Battle of Utria. Finnish volunteers returned to Finland on March–April 1919, having lost 150 men. Danish-Baltic Auxiliary Corps with approximately 200 men was formed under the command of Captain Richard Gustav Borgelin in April 1919. The company took part in battles against Bolsheviks in Latvia and near Pskov and 19 men were killed by the time their contract ended in September. R. G. Borgelin was promoted to Lieutenant Colonel and given Maidla manor in gratitude for his services. On 2 February 1920 the Peace Treaty of Tartu was signed by the Republic of Estonia and RSFSR. At this point, the Bolshevist regime had not been recognized by any Western power. The terms of the treaty stated that Russia renounced in perpetuity all rights to the territory of Estonia. The agreed frontier corresponded roughly with the position of the front line at the cessation of hostilities. In particular, Estonia retained a strategic strip to the east of the Narva river (Narvataguse) and Setumaa in the southeast, areas which were lost in early 1945 – shortly after Soviet troops had taken control of Estonia, when Moscow transferred the land East of the Narva River and most of Petseri County to the RSFSR. ^ a b c d e Jaan Maide (1933). "IV". Ülevaade Eesti Vabadussõjast (1918–1920) (PDF). Tartu: Kaitseliidu kirjastus. ^ a b c Jaan Maide (1933). "II". Ülevaade Eesti Vabadussõjast (1918–1920) (PDF). Tartu: Kaitseliidu kirjastus. ^ "Kaitseväe ajalugu". Archived from the original on 2009-09-26. Retrieved 2009-09-29. ^ Spencer C. Tucker, ed. (2005). "Goltz, Rüdiger von der, Count (1865-1946)". The Encyclopedia of World War I: A political, social, and military history. Santa Barbara, California: ABC-CLIO. pp. 492–493. ^ Rushton, James A. (June 2006). "OPERATIONALIZING DISSUASION (Thesis)" (PDF). NAVAL POSTGRADUATE SCHOOL, Monterey, California. Archived from the original (PDF) on 2008-09-16. Retrieved 2008-07-24. ^ "Krasnaja Gorka Operation 13 October – 9 November 1919 (Baltic Military History Newsletter)" (PDF). baltdefcol.org. Baltic Defence College. October 2014. Archived from the original (PDF) on 28 January 2015. Retrieved 24 January 2015. ^ Tepora & Roselius 2014, p. 138.